When faced with doing an ergonomics evaluation for a Plus Sized Worker (PSW), many ergonomists may feel somewhat anxious or uncomfortable. In such situations, many ergonomist’s “go to” solutions for the average worker are inadequate or not usable at all with this population. However, there are solutions and answers for the ergonomics needs of this population of workers. 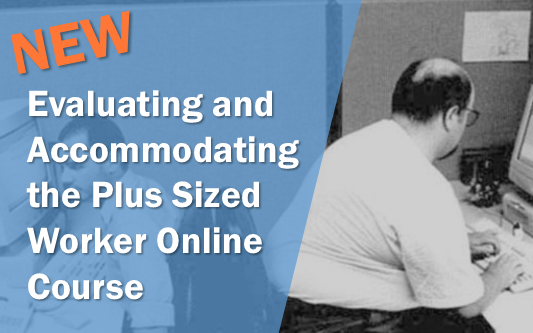 Due to the popularity of our Ask the Experts webinar on this subject, we are pleased to introduce – Evaluating and Accommodating the Plus Sized Worker. This all new online course gives you the tools and knowledge you need to properly assess this unique population and provide effective products and behavioral modifications to minimize ergonomics risks. Now through October 31st you can save more than 20% on this all new online course. Be able to help reduce the risks of MSD’s for a PSW. Assist in team building by being able to reach out and be a resource person for PSW ergonomics issues. Identify and better understand selected biomechanical issues of being the PSW. Provide workstation modifications to improve the comfort and proper fitting of the PSW. Reduce injuries to employees through improved ergonomics awareness for the “Plus Sized” co-worker.